Am I really a Homo Hero? 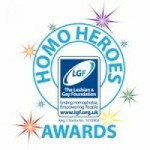 I’m delighted to be able to announce that you have been nominated by the community to be put forward to the public vote for The Lesbian & Gay Foundation’s Homo Heroes Award 2012 in the category ‘lesbian, gay or bisexual role model’. It’s not often that I’m lost for words, but I was after this. I had been nominated by the LGB community as a role model for challenging the homophobic and racist discrimination I had endured at work and sharing my experiences through my writing etc, together with supporting events to help others. I’ve had a great relationship with The LGF, but my nomination coming from outside of the organisation is humbling. My writing and speaking about social justice and equality clearly was never planned giving the job I was doing, but came as a result of my illness with depression because of homophobia and racism. So, being nominated for such an award is surreal. Although I do get the odd homophobic and/or racist message sent to me because I write with my voice, the overwhelming are supportive. I often say to others that, people are fundamentally good – and despite my own experiences, I still believe this. Anyway, if you think I’ve been or am a Homo Hero you can vote for me and the other nominees in each category online at www.lgf.org.uk/hero. It just shows you that, good can come from bad.